The Latest Lame Attack on Trump: There’s Nothing on His Desk! RUSH: Are you aware of the latest attempt by the Drive-Bys to portray Donald Trump as vacant, stupid, dumb and empty minded because his desk doesn’t have anything on it? (interruption) Don’t switch yet. Just get ready in there for the switcher. But don’t switch it yet. Now, this is the second time they’ve done this. I forget how long ago it was, but the Drive-Bys ran a story with a photo of Trump’s very cluttered desk, and the stories that accompanied that photo said — and these were emotional/psychiatric experts and behavioral experts telling the Drive-Bys, “The cluttered desk means a disorganized, cluttered mind — and this is a danger! To have somebody that appears this haphazard and this disorganized, not knowing where anything is and the mess keeps getting bigger and bigger? “It is a perfect metaphor for Donald Trump’s brain in general, and we are all in grave danger and posed a great threat by Trump’s obviously overtaxed mind.” Now, that was some weeks, maybe months ago. Yesterday, the Drive-Bys published a story of Trump sitting at the Oval Office desk wearing a Make America Great Again cap and a white polo golf shirt, and there’s nothing on the desk. The stories accompanying this picture say, “Trump is dangerously empty! His mind is vacant, and he obviously doesn’t do any work. There isn’t anything on his desk. “The guy’s a putz. The guy doesn’t know what he’s doing, and the evidence is there isn’t anything to do, because he has no work on his desk whatsoever. We are in grave danger!” So I told Cookie, “I want you to go out there and find me — ’cause there are many of them. I want you to find me a photo of Ronaldus Magnus at his desk, and we found many. We’re gonna switch to it. If you’re watching on the Dittocam, you’ll see it, because we’re going to switch to it. (switches) There is Ronaldus Magnus right there at his Oval Office desk. And, as you can see, the only thing on it is a phone. 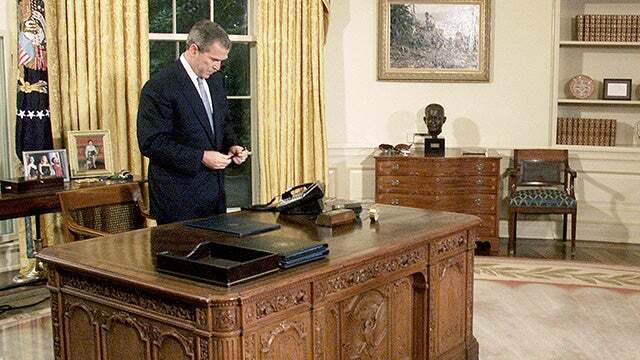 That’s how Reagan’s desk looked practically all of the time. There were occasional photos where Reagan had documents, individual pieces of paper on the desk that he was reading or signing. But that’s pretty much what it was, because, folks, the Oval Office is ceremonial. The work that gets done in the Oval Office occurs on the sofas. If you’re looking at the picture, the sofas are parallel to each other with a coffee table between them. But really not much work gets done in the Oval. Do you know that if you…? Well, this is not for the public tours of the White House, but if I happen to go to the White House and the president wasn’t there, the Oval Office is wide open. They’ll take you there and they show you anything, ’cause nothing’s in there. It’s ceremonial. Now, I mean, it’s not part of the public White House tour. I don’t think it is. I don’t think the West Wing is part of the tour. But the work that happens in the West Wing happens in the Cabinet Room or the Roosevelt Room or on the phone. But it’s not a traditional office in the sense… Even bill signings. Some occur there, but not many. They occur in the Rose Garden or a room big enough to get all the congressional cosponsors in there to participate in the photo-op. 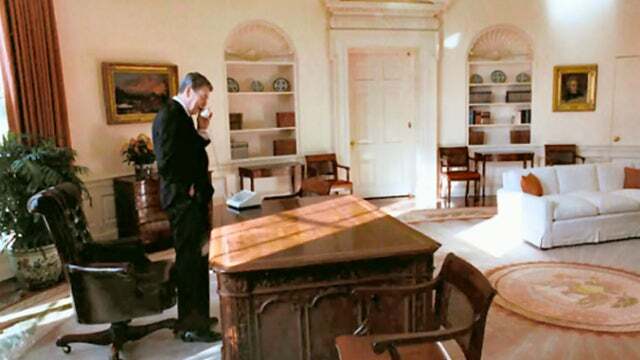 There are also pictures of the great one, Barack Hussein Obama, with his desk totally empty. I didn’t bother putting any of those up, ’cause who wants to look anymore at Obama in the Oval Office. You talk about shock therapy? But don’t doubt me. The idea of a desk… Well, it’s rendered moot anyway because Drive-Bys have gone at this from both angles. Trump, at one point when he was first there, had a lot of stuff on the desk and they said, “This is a cluttered, disorganized mind! We are in grave danger!” Now they’re running a photo with nothing on the desk, “We are in grave danger! Trump don’t know what to do! He’s so stupid, there isn’t any work on his desk. It may mean that his aides don’t trust him to do anything. “It may mean that Trump isn’t doing any work whatsoever, which wouldn’t surprise us because we know he’s a blithering idiot.” That’s the news accompanying the photo today by the Drive-By Media. I’m not kidding. (switches) Okay, you can switch back to me now. Oh, they just did. But we could show you pictures of Obama’s desk and George W. Bush. Even right now, Fox is running an interview or a tape of people in the Oval Office. There’s a fireplace in there, and whenever Trump has an official guest, they sit on either side of the fireplace, and the media comes in and they ask stupid questions. Trump gives them the answer, and they get kicked out of there, and they sit around and talk, usually sitting on the sofas. But in terms of it being an office like you and I would have and do a sit-down and do work, not much of that happens because the work of the president occurs many levels, many ways, in many, many different places. In fact, presidents never stop working no matter where they are, just like important radio talk show hosts. No matter where we go, we’re working. Anybody… Most everybody who works is working wherever they go, in their mind. So it’s just another cheap attempt, an obviously flailing-away-at-nothing attempt… (interruption) Well, I was gonna say that, but, you know, I decided to keep this out of the blue dress arena. When I talked about the work that goes on on sofas… Actually, that’s… I haven’t heard of Clinton using a sofas that way. In fact, put that picture back up. Put the picture back up. (switches) The door that you see there to the left of the desk, if you open that door, you go to the private dining room, which Obama had turned into a room for his buddies to come in and watch NCAA and NBA basketball. I saw it! Off of that dining room is another little, smaller private study and the private restroom — and that’s where Monica and the cigar were found, on the other side of that door. I was in the Oval Office two weeks after George W. Bush was inaugurated in 2001. I was in there with a bunch of Major League Baseball players and their wives. Joe Torre was there, Tom Glavine, and the late great Don Baylor. A bunch of great baseball players. Bush was a huge baseball fan. Everybody there was… I mean, it was just two weeks prior that Bill Clinton was in there, and it was just a few early years from that that room… I mean, everybody was interested in that room because of what went on in there between Clinton and Lewinsky. And everybody was just kind of, “Ew! I hate having to think that that’s what happened here. I’m in the Oval Office of the president of the United States and what am I thinking of? Cigars, blue dresses, and interns!” You couldn’t help it. I mean, two weeks prior Clinton and whatever else he was doing was in there. Then you realize Hillary had been waddling in and out of there. Presidents change the desk. 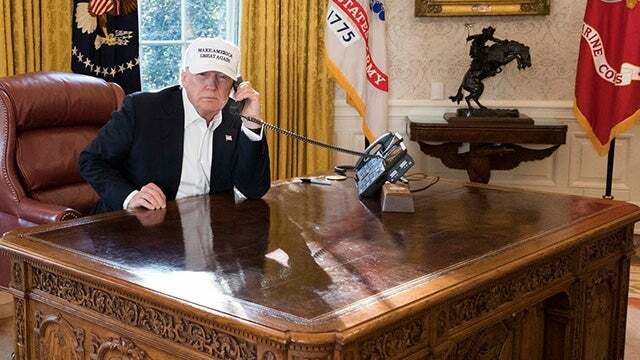 I think Trump is using Reagan’s desk, if I’m not mistaken. They changed the carpet that’s down on the floor between the two sofas. But, yeah, right through that door is… And it’s a decent size private dining room. You can probably seat eight or more, maybe 12 at the table. But it was used as an NBA theater, NCAA college basketball theater for Obama. All right. Thanks. Switch it back to me now. This is why people tune in to the Dittocam.